This site has hardly been a non-stop thrill ride in the last few weeks (ok, ever!) but the silence will continue for the next two weeks as guapacha.com is going to Alaska! Husky farm tour – awww, those cute little husky pups! So, I’ll think of you all while I’m in the buffet line and will post pictures on ye olde Flickr site when I get back. We need some anti-electricity bill powder from the bat belt: our power bill for July – $454!!! Right now it’s a Japan-only title and that to me is most of it’s charm. Check out this video trailer and see what I mean. 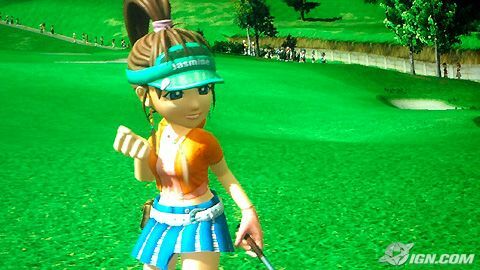 You’ve got the crazy looking characters, and even some cute chicks in non-LPGA short skirts and stockings but its the music and the manic Japanese voices that make it so much fun. The courses are gorgeous – ostriches were walking across the green yesterday when I was trying to sink a putt on an Africa-themed course – and the control mechanisms straightforward. I’m really not sure what is going on outside the golf since all the menus and announcements are in Japanese but that’s it’s charm. The US version comes out October 1st and I think it’s a must buy, though I wonder what it will sound like in English. I’m told that previous versions did a great job but we’ll see.